Horror stories emanating from USA do not shock us anymore. We have come to expect drive by shootings, mall massacres, school yard killings and the like. In India we have our own share of horrors so there is no comparison. However, the Police in India in spite of the occasional instance of violence is much better behaved than in USA. The cases of "fake encounters"that spring up from time to time are due to the inherent flaws in the judicial system with its dependence on procedure and witnesses, that sometime the Law and Order Machinery takes recourse to eliminating the violent criminals. It stands to reason that no one would like to give evidence in a court of law about the violent acts committed by a dreaded gangster. The police in India are now armed only with a fiberglass truncheons and are issued weapons only on the direct order of the Superintendent of Police and he too can issue weapons only on the instructions of the District Collector. 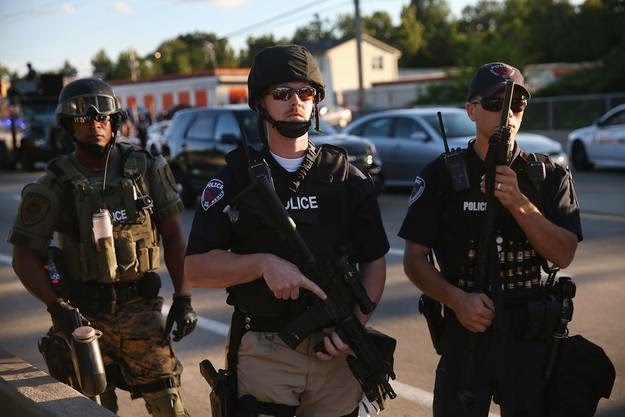 I am not saying that the police are totally under the control of the civil district administration, but I can state with some authority that it would be impossible for the Police to getaway with the kind of violence which was visited upon the town of Ferguson, Missouri, USA. Darren Wilson, a white policeman shot and killed Michael Brown a young black man who was apparently walking with his friend Johnson. The attack seems to have been unprovoked as Michael Brown raised his hand the moment Darren Wilson asked him to surrender. The police officer kept firing at the young unarmed youth and he died after being hit by 3 bullets on his chest. It is surprising that the policeman shot the youth on his chest when in most parts of the world the police are asked to shoot at the lege to prevent the fugitive from escaping. In this particular instance, the young man was not a fugitive and was unarmed. The pictures that I have placed on the side of this blog may appear to be a picture from a war zone. Men in body armour,. armed with 5.56 mm short barreled rifles which are both automatic and semi automatic depending on the configuration used, and with a few pouched of ammunition around their waist. We can also see a sniper armed with a telescope keeping an eye from a building. All these men have the authority to kill and the American establishment does not order judicial probes as do our government. I remember that a great scholar of South east Asian Archaeology, Dr Roxanne Brown was killed in prison solely on the unfounded suspicion of being involved in a art case. I am giving these examples only to show that in spite of the situation in India with its crude theatrics and corrupt officialdom, something like what happened in Ferguson, USA is well near impossible. Arming the police with military equipment is against any principle of civilian governance. The police can carry weapons but its use must be strictly controlled. In USA the police carry arms and can open fire in self defence. And if self defence is claimed, there is no argument because it is assumed that everyone is armed and dangerous. The police are expected to open fire first and then engage. This kind of training has led to the unavoidable tragedy in Missouri. Like their counterparts in India, the US police are not above inventing a "narrative" to justify the deed. In the case of the killing of Michael Brown, the Ferguson Police Department has released video footage to suggest that Brown was involved in a hold up in a convenience store. What did he allegedly steal, : a few cigars. In any even, the Officer Wilson was unaware of the hold up when he shot the young man dead. 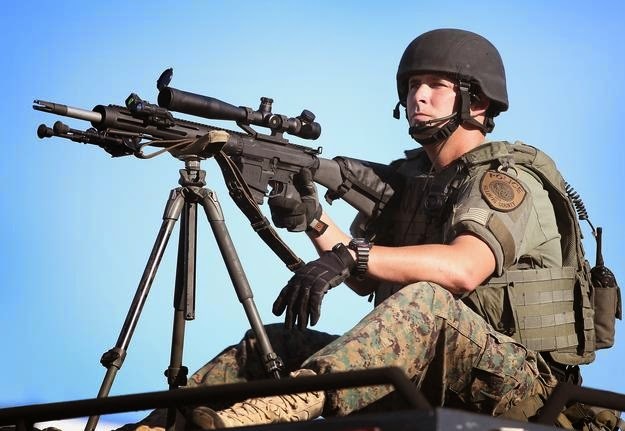 It is time for USA to make its police force a civilian force and not use it as a Military auxiliary unit. The most disturbing aspect of this tragedy is the fact that the American Media was muzzled. USA sanctimoniously preaches to the rest of the world about "Freedoms" and it has come to light that the Al Jazeera TV crew in Ferguson was shot at with rubber bullets by the Police. In what way is US treponse different from other authoritarian rsgimes. What I predicted in this post has virually come true in Dallas when 5 police men were shot dead by snipers. There can be little sympathy for a police force which treats its own citizens the way an occupation force would operate.